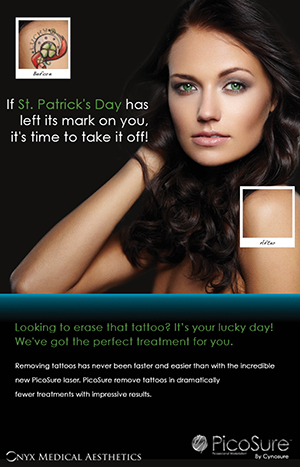 Onyx Medical Aesthetics Declares March 18th National Picosure Laser Tattoo Removal Day! 20% on your 1st Treatment PicoSure Laser Tattoo Removal Treatment, The World’s Most Advanced Laser Technology for Tattoo Removal From Cynosure Inc.
Kitchener, Ontario – St. Patrick’s Day might have us feeling like we all have “the luck of the Irish,” but if the day’s festivities has literally left its mark on you, it’s time to take it off with PicoSure Laser Tattoo Removal! In light of this notorious holiday where celebrating can end in getting a tattoo you might later regret, Dr. Michael Kam, is declaring March 18th as “National Remove Your Tattoo Day” with PicoSure®, the world’s only picosecond aesthetic laser for tattoo removal which effectively erases tattoos with fewer treatments and better results. “For anyone who may be looking to erase these unlucky mistakes, we’ve got the perfect treatment for you, says Dr. Michael Kam. “Even tattoos that have been treated previously, but failed to clear, can be removed with PicoSure Laser Tattoo Removal. An unparalleled breakthrough in tattoo removal technology, PicoSure’s PressureWave™ gently delivers ultra-short pulses of energy to the tattoo ink in trillionths of a second without injury to the surrounding skin. This shatters the ink into tiny particles that are easily eliminated by the body. Based on physician studies1,2 PicoSure has proven efficacy on difficult ink colours, as well as previously-treated tattoos, for better clearance with fewer laser treatments and improved recovery time. Fortunately for individuals who may regret their spirited shamrock tattoo that was hastily inked, one study demonstrated at least 75% clearance of blue and green pigment after just 1 or 2 treatments with PicoSure Laser Tattoo Removal. Whether you regret a holiday tattoo or are amongst the nearly 20 percent of the 45 million Americans who regret their tattoo decision; PicoSure has made tattoo removal faster 1,2. Call Onyx Medical Aesthetics to learn how PicoSure can help shatter the past and reveal your new future. For more information, or to arrange an interview with Dr. Kam about PicoSure Laser Tattoo Removal, please call 519-404-1524 or complete our Aesthetic Contact form. For regular updates and PicoSure Laser Tattoo Removal promotions, follow us on Facebook. Treatment of Tattoos With a Picosecond Alexandrite Laser: A Prospective Trial, Nazanin Saedi, MD; Andrei Metelitsa, MD, FRCPC; Kathleen Petrell, BS; Kenneth A. Arndt, MD; Jeffrey S. Dover, MD, FRCPC Arch Dermatol. Published online September 17, 2012. doi:10.1001/archdermatol.2012.2894.